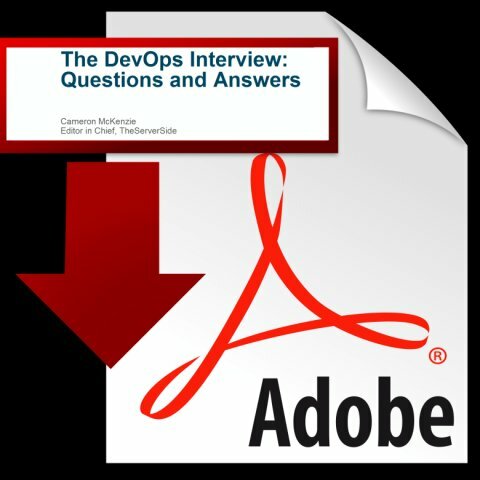 I recently published an article entitled Tough DevOps interview questions and answers and there was a great deal of interest in having the article available in the good old portable document format (PDF). TheServerSide has been providing a great deal of coverage of various DevOps tools such as Jenkins, Git, Maven repositories such as Nexus and Artifactory and of course Docker and Microservices development frameworks such as Spring Boot and the Eclipse Microprofile. As such, we urge anyone searching for a DevOps interview questions and answers PDF to stick around and take a gander at some of the other resources we provide. There’s even a sample Jenkins interview questions and answers article anyone preparing for a DevOps interview would find helpful as well. Check it out. DevOps interview questions and answers pdf for experienced engineers available for download.